The maximum occupancy is 3 persons including children of all ages. Violations result in loss of all deposits, immediate eviction and the loss of the ability to make any future bookings at this condo. The resort charges a fee of $20 day, payable to the front desk upon checkout. This covers wifi, pool towels, pool and hot tub use, fitness center, use of tennis courts and BBQs. There also is a parking fee of $6/day per car also payable to the front desk upon checkout. Resorts that require “resort fees” for guests staying on the property solely make the decision on what the amount of the fees will be and it is out of the control of the owner of this property. These fees are subject to change at anytime without notice and could change before your arrival and could be different than the original fee stated in your reservation. We make every effort to communicate changes in fees as soon as we are notified. The resort restaurant is closed indefinitely. However the lounge/bar is now open. Regular check-in time is 3 PM and check-out time is 10 AM. Please plan your arrival and departures times accordingly. Guests will be charged $50/hour for occupying the condo any time past their scheduled check-out time. An early check-in time or a late check-out time may be available for a fee. Totally recommended. I traveled to this condo for my honeymoon and it was excellent. Kauaii was my favorite island. In favor: It is a great location for exploring the north shore. Only 10 minutes ride to Hanalei bay and close to beaches. It has great views towards the mountain. These really make the difference. The kitchen is well equipped and the air conditioning works ok. The bed and the couch are confortable. The condo is quiet and it makes you feel you are the only one around. The amenities are very good, as the pool or gym. Although we didn`t use them much. It has a special access to the beach, right next to the St. Regis Hotel. Great for sunsets! Against: The condo is in the Princeville residential complex which is a vast modern development, different than the traditional "plantation" houses in Hanalei but still very close to Hanalei, Haena, Tunnels and the Na Pali coast. Would definetely stay here again! Tip: For restaurants, Postcard & Barracuda are the best in Hanalei but my favourite place is Tahiti Nui with live music (usually Hawaian at 6PM, Rock bands at 9PM) with the best Mai tai (and special pizza) of the islands. Bright Southern Facing View of gorgeous mountains and waterfalls. 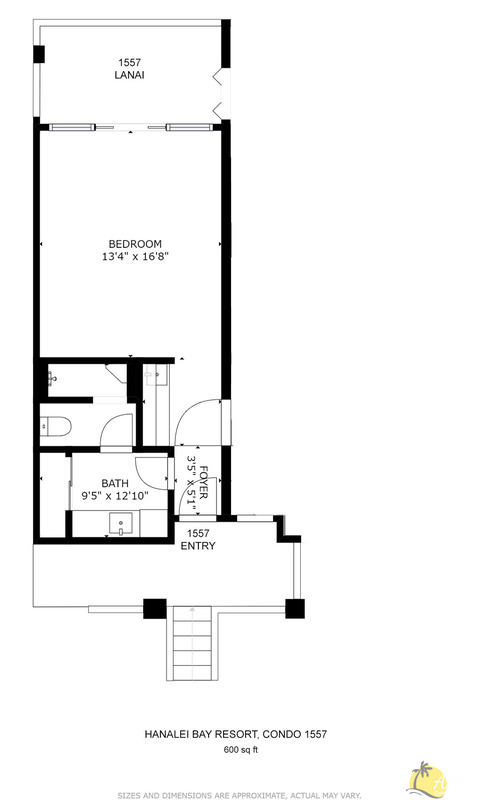 Studio 1-Bathroom Suite with Kitchenette, Sleeping Area, Living Area and Mountain View Lanai - 550 square feet of living space. Thank you for your review of unit 1557 at the Hanalei Bay Resort. Thank you for your comments on the unit , its amenities and clean condition. We wish we could accommodate the guests with a microwave and water kettle but the county of Kauai has put restrictions on these units and will not allow those items. Our website does reflect this information and does not list those items as part of the rental so that when booking guests are completely aware. We are hoping that some point in time the County will left the restriction. Thank you for your review for the unit 1557 at the Hanalei Bay Resort. We are happy to hear you found the condo comfortable and well stocked. The views of the mountains are amazing! The WiFi is a resort amenity and not specific to the unit or the owner of this unit. There is not a separate WiFi for the unit itself. The resort WiFi works in all the units of the resort. Therefore when there is a problem with the WiFi, it should be directed to the resort. We are happy to say, a brand new air conditioner was installed yesterday so there will be no further problems with cooling. If you do let us know ahead of time we can schedule a midstay clean during your stay for a fee. However the unit is supplied with a vacuum, broom and other cleaning products to use. Thank you again for your feedback and we hope you might be able to come again and stay. Thank you for the glowing review of unit 1557 at the Hanalei Bay Resort. The location of the resort and the views from the condo are amazing. The resort amenities are many! Thank you for your recommendations and we hope you do come and stay again! We loved the mountain views,and rainforest experience off the back lanai with all of the birds and frequent visits from chickens. However, we couldn't use the air conditioner since it made a horrible racket, but the natural air wIt's the ceiling fan was just fine. . The screen door didn't work well and the bedding was quite shabby and needed updating. Otherwise it was just right for us. Thank you for taking to time to respond to our request for a review. We are glad this unit work well for you and the beautiful views were enjoyed. We wish you would have said something during your stay so we could have checked out the noise with the air conditioner and the slider screen. We will be taking a look at those things. Alot of the bedding had been replaced in recent year but we will take a look. The owner of this unit has put so much into this unit in the last year with new renovations, remodel of the bathroom, a brand new kitchenette and new paint. Most of the furniture was purchased just a few years ago also. We hope you can come back soon and enjoy! Condo 1557 was quaint and in nice condition. Not to mention the view was amazing! We had a gorgeous view of the mountains. The lanai has a small table and two chairs - perfect for breakfast in the morning. The bed was a type of foam mattress. As a spoiled tempur-pedic mattress owner, I found this foam mattress not as comfortable. The kitchen area is nice with a induction cook top, toaster oven, microwave, mini fridge and sink. We only made breakfast (eggs and toast) as we were explored the north shore during our stay. Not that we watched a lot of TV, but we thought the location of the TV (above the sliding glass doors) was a bit off. You could not relax on the couch and watch TV at the same time. The bathroom was big! Plenty of room for two people to get ready for the day. The condo also included beach chairs, which we seriously enjoyed! It was a nice convenience. There were many other amenities and features in the condo that we did not use. The nearest ice machine is a nice walk 1/2 way across the resort. We only have two minor complaints. First, the air conditioning unit did not keep the room chilled. We would turn it on after dinner (around 6-7pm) and the room would not chill down until the morning - even using the ceiling fan. This made for a warm and sticky night. Unfortunately, there isn't an opportunity to have a cross breeze as the only two doors/windows is the front door and the sliding glass door...and we were not going to sleep with the front door open. Second, the bar/grill at the Hanalei Bay Resort is open for limited hours. We tried to book a reservation and they stated they were full. However, when we walked by several times, there was an abundance of open tables and seating. My guess is limited staff? The other restaurant on site appears to be closed indefinitely. We were not told of this until a week before our vacation! The Resort website stated it would reopen in 2017. When they say check-in is at 3pm, they mean it! Our room was ready an hour before, but we could not check-in early. So we hung out in the lobby as the Happy Talk bar & lounge wasn't open until 3pm. We stayed for two nights in February 2017. Given we like to try different places, if we return to Hanalei Bay area, we probably won't stay at this resort again. Thanks you so much for taking the time to respond to the request for a review for the unit 1557 at the Hanalei Bay Resort. The unit is in good condition as it has very recently been remodeled with a new bathroom and kitchenette as well as recent new flooring and furniture. The bed of course cannot accommodate everyones desires as it is such an individual taste. We however usually do not have complaints about the bed. The unit does have lots of great features and it is always nice to have some beach equipment which is an extra bonus. We wish you would have called us about the air conditioner during your stay as we could have looked into it for you as we have not had any complaints about it. We do respond to our guests needs and like any property things from time to time need attention. The lounge/bar on the property are privately owned so therefore we do not have any control over the hours but we do have lots of good feedback from other guests. The restaurant has been closed for many many years and was due to open sometime in the 2017 which might get delayed further. However the websites all state that the restuarant is not open as of yet so that when booking you are array of it. We had the most incredible stay here. My husband and I could not be more pleased with our decision to stay here. Ideal location on the north shore. Just a quick drive to multiple beaches, quaint town of Hanalei, hiking on the Napali. Luxury of getting to make our breakfasts in the condo and eat on the balcony over looking a view that resembles Jarassic Park. The pool area, Happy Talk Lounge and beach (shared with St. Regis) were very convenient on days we weren't exploring. Must pour yourself a drink and go watch the sunset at the fire pit lounge chairs by the tennis courts. Plenty of delicious dining ( Makena Terrace, Bar Acuda, The Dophin) and fun eating/bar spots ( Tahiti Nui, wishing well, St. Regis bar). Fun ideas we enjoyed- driving up the coast to the end of the road, lighthouse, queens bath, farmers market, hiking to the waterfall on Napali trail, gardens by Tunnels beach, massages at Hanalei Day Spa, pool is great for lounging. Rent a car, worth every penny. Again, it was incredible and we can not wait to return to the resort!! Thank you for the great review! We are so glad that you enjoyed your stay at the Hanalei Bay Resort unit 1557. The resort does offer a lot of great amenities and the location is great and convenient to lots of island activities. The unit has been remodeled recently and the views are pretty amazing from the lanai. We hope you can come again soon! We've been to Kauai 4 times in the past but this was our first stay at Hanalei Bay Resort. We were so pleased with the accommodations at #1557 and would definitely return here on a future trip. The location of the building can't be beat. I looked at all of the other buildings and couldn't find one I'd rather be in. The view was private, amazing and peaceful, I can't wait to go back! I really appreciated the kitchen amenities as we enjoyed making a few meals and eating out on the patio. The photos in the listing are spot on, too. Such a great trip!!!! Would avoid Condo 1557 .Kitchen did not have a single bowl, paring knife or can opener that worked. Cooking pans need to be cleaned .Only way to watch TV( mounted above the patio door ) was if you were laying in bed. Furniture need to be arranged differently. Our group rented 7 condos total . Ours was the most poorly furnished. Our grandUghter stayed next door. Their roof leaked over the bed . Grounds and pool were beautiful. Lack of restaurant anywhere nearby would be the final thing to make us choose another resort next time. We went for wedding on the property, it was lovely. We loved the pool, hot tub, and grounds. Totally recommended. I traveled to this condo for my honeymoon and it was excellent. Kauaii was my favorite island. In favor:It is a great location for exploring the north shore. Only 10 minutes ride to Hanalei bay and close to beaches.It has great views towards the mountain. These really make the difference.The kitchen is well equipped and the air conditioning works ok. The bed and the couch are confortable.The condo is quiet and it makes you feel you are the only one around. The amenities are very good, as the pool or gym. Although we didn`t use them much.It has a special access to the beach, right next to the St. Regis Hotel. Great for sunsets! Against:The condo is in the Princeville residential complex which is a vast modern development, different than the traditional "plantation" houses in Hanalei but still very close to Hanalei,Haena, Tunnels and the Na Pali coast. Would definetely stay here again! Tip: For restaurants, Postcard & Barracuda are the best in Hanalei but my favourite place is Tahiti Nui with live music (usually Hawaian at 6PM, Rock bands at 9PM) with the best Mai tai (and special pizza) of the islands. We are so glad we were able to accommodate you in your honeymoon! The Location of the Hanalei Bay Resort is special with the direct beach access and the beautiful sunsets. This unit with the beautiful mountain views makes you escape to a true paradise. The resort does have great amenities and is lush in tropically landscaping throughout the 22 acres. The North shore location is great for many different activities. The well equipped unit is very accommodating. We are glad you enjoyed and hope you can come back each year! The apartment was nice and clean upon arrival. There was a nice greeting bag from the realty company (nice touch). We loved the decor and the view from the deck! The couch was very comfy and the furniture nicely designed. Although there was no stove, we were able to make due and found ourselves eating a meal a day there. A few things to consider for the next people: The bathroom tub was clogged! We showered in a pool of grime every time we showered. Yuk! Must take care of that...The lights in the hall do not turn off. It was like a big night-light in the hallway. I did not like sleeping that way. Not sure if there was an option to shut off, we could not find it. Other than that, it was worth the price and we would stay there again. The hotel amenities really made the difference! Thank you for your review and taking the time to post it. We are glad you found the condo to be nice and clean. It is a lovely view from the lanai and very serene! The owner just remodeled again and upgraded the kitchen in May 2016. The condo now has a ceramic stovetop, granite countertops and sink in the new kitchenette. As before, we provide a microwave, a mini refrigerator, a coffee maker, blender, dishes and flatware. There is also a BBQ very close by on the property grounds. There was also new travertine flooring and a new shower just added to the large bathroom. We hope you can come back and enjoy the remodeling updates to this condo in the near future. Enjoyed staying at this condo. Great location, close to town and the beach. Would definitely stay there again. We absolutely loved our stay at Condo 1557 at Hanalei Bay Resort. The resort has amazing facilities and the pool is fantastic. Our baby girl loved swimming in there everyday. The condo itself has everything you need...towels, all linen, basic kitchen stuff, crockery, cutlery, glasses as well as beach equipment :)From the balcony the views are gorgeous and its quiet private. We felt like we were the only people there as you don't look out to see anyone else balcony. All the staff at reception are lovely, especially Jack Alex, he was very helpful and friendly. Perfect is a word we like to hear! Thank you for your review for the unit 1557 at the Hanalei Bay Resort. For a studio unit with a great price you cannot beat it! It does have everything you need and extras that you might not of guessed would be supplied. The boogie boards and the beach chairs are an added amenity with our units. This allows for a great convenience of not having to rent them. The resort, the pool, the grounds and the beach access are amazing! We do hope you will come and enjoy this destination once again! Perfect Location, private with Amazing mountain Views. We absolutely LOVE staying on this place! The resort has easy parking all the way around, there is washers very close from each union, gardens are very pretty and front desk was always pleasant and helpful.Apartment was clean, especius, had everything you need to spend even more then a week comfortable if thats what you are going for. It even has beach chairs, cooler, tennis rackets etc. Sad that we discover this in our last day... This unit if facing the mountains so is very private compared to the rest of the units in the resort, for us, a very much need it for a retreat :). Seating in the porch haven tea looking at the water falls was stoning... We never ran the AC mountain breeze was plenty to keep us cool, the best NO MOSQUITOES!We both have back problems and the mattress in the union was incredible comfortable (I wanted to take it home with us). The decoration of the apartment is very modern, they have a few handy books about Kauai, if you don't know the area they come very handy.Booking proces was easy and they responded very promptly to any of our concerns. Kauai is by far one of our favorite islands (please note that this is big for us to comment on seance we are coming from one St. John USVI) we can't wait to go back in June 2016. 1) Helicopter tour (blue helicopters) is the best company around, their helicopters are big, stable, they aren't that loud, and the service is great. Their helicopter is glass all the way around so is easy for any person (no matter your location in the helicopter) to have a great view and take pictures. 2) LU'AU KALAMAZU show is incredible, Im not going int the details because I will give it in, totally worth it if you are interested on their culture. 3) Hikes, there is endless numbers of hikes for any levels. Thank you for your wonderful review for your stay at the Hanalei Bay Resort unit 1557. We are so happy that you found this unit to have all that you needed for your vacation in Kauai. We do try to have the units stocked with extra things to make each stay a pleasant experience and very accommodating. The views are very serene from this lanai and private as well making moments spent taking in the sites of the mountain ranges relaxing and tranquil. Thank you also for noting the furnishings and your satisfaction. The owner has recently put all new furniture and has had the interior painted and new flooring installed. Since we booked our room at such a low cost, we weren't sure what to expect when coming to Hanalei Bay Resort. Needless to say, we were blown away. The resort is beautiful, the pool is amazing (with happy hour! ), and our balcony had a wonderful view of the Kauai mountains. We want to come back here again as regulars! The actual private condo we stayed in was very nice and had a very nice view over the canopy of trees and looking toward the mountains. Best bed we ever slept on anywhere! Very roomy for a studio. The actual site is beautiful-fully landscaped with large pool. Only complaint is no restuarant and it looks like the actual building of the one advertised is way behind schedule and likely to remain so. Also research thoroughly how to get to the area, especially if you are coming in at night--its a challenge! Mahalo for your review of unit 1557 at the Hanalei Bay Resort. We are pleased to hear your stay was a good one and the unit was to your liking. This unit does have an incredible view of the surrounding mountains giving a very serene and peaceful space as you enjoy and relax on the lanai. The resort itself is beautifully landscaped and maintained adding to the whole experience. The restaurant is still being constructed as you mentioned. The restaurant is owned by a private party and unfortunately we do not have any control over the time line. However there are several restaurants to choose from in Princeville and Hanalei as well as a short walk down the bluff will lead you to the St Regis where there are a couple of choices for your dining needs. The Hanalei Bay Resort is located on the bluff in Princeville and one must drive through some residential areas for access. Therefore with each reservation, emails are sent out with all the information you will need for your stay with us including detailed directions from the airport to the resort. This email is multiple pages and one must scroll down to access all the valuable information. Thank you again for taking the time to send us your review. It is much appreciated. Lovely complex, enjoyed the pool & beach. Condo very nice, very comfortable bed. Small kitchen area, but well equipped! We loved sitting on the balcony, watching the ever changing mountain view. A reading lamp beside the couch would make this place perfect. Mahalo for your review and comments. I'll be putting a floor lamp into the condo later this week. We've scheduled another remodel for April 2015 to include a new bathroom - we're removing the tub and putting in a shower, an expanded kitchenette area - including a sink and new flooring throughout - a continuation of the new flooring put in last year. We appreciate your business and thank you again for staying in my condo at Hanalei Bay Resort. With all of the resort changes finally coming to completion, I look forward to providing an amazing resort and condo experience for my guests. Great for a couple or singleton looking to get a way in the beautiful island of Kauai. Very simple accommodations, but perfect if your plan is to complete all the adventures the island has to offer (hiking, surfing, snorkeling). Great location in Princeville, safe, close to Hanalei, and by far the grandeur and magnificent view of the waterfall was superb. This unit offered a quiet stay as if we were the only one's on the island. The only negative to the place is a very small kitchenette, however we made do and were able to become resourceful making eggs in the morning, and enjoying a lot of sashimi style tuna. It's great to be able to use all the accommodations of the resort, tennis, pools, BBQ, and walk down to the beach. Most of all for location, view and accommodations, outstanding price!" The condo is very nice, well maintained and equiped. It is very confortable for 2 people and has a perfect lanai with superb views of the mountains. The resrt is being renewed so front office is not the best and there are construction materials all over the way between the entrance and parking lot and the condo. It would have been better to be able to park at the condo entrance instead of a general parking but I guess considering the terrain that s not quite possible. Hanalei Bay resort is in Princeville, on the northern shores of beautiful Kauai. We arrived very late, after a 20-hr journey from our home state of Pennsylvania. The front desk was friendly and accommodating. A bellman loaded our things into a golf cart, drove us to our condo, and helped unload all our stuff into the room. We stayed in building 15, 2nd (top) floor, condo 1557. It's a 1-room condo, but the room is large and feels very spacious. From our lanai we could see a jungle to the left and then a beautiful mountain range which is home of the Waioli Falls, the longest waterfall on earth. In fact there were many waterfalls dispersed through the mountains. The room was beautiful, 20-ft ceiling, over-sized dark wood (Mahogany?) furniture, king-size bed, a desk and a large love seat. It was stocked with everything we needed for our stay: kitchen supplies, a small fridge, microwave, dish/paper towels, soap, tennis rackets, cooler, snorkeling equipment, etc. (NOTE: the condos are individually owned, so what is supplied may vary). The only negative about the condo is that there is no separate sink for food preparation (the area with a microwave/fridge is tiny, as if put in there as an afterthought). Each morning, we awoke to roosters and a stunning view of Kauai’s mountains! The grounds are beautifully maintained, even though there was a lot of construction going on (they are building a new on-site restaurant and a new front desk). There are 2 pools, the upper pool is beautiful, like a lagoon! There are tennis courts, 2 laundry facilities (detergent and quarters available at the front desk). The beach is no more than a 10-minute walk on a wide concrete pathway. The beach is shared with the 5-star St. Regis hotel. Dealing with the condo owner was a breeze. Very accommodating/responsive. I communicated via e-mails and got a wealth of information about the island of Kauai. You will absolutely need a rental car to explore Kauai and everything it had to offer. We will be back! Unit 1557 at the Hanalei Bay Resort was a true gem! So peaceful, with a panoramic view of nature at it's best. In the morning, we would wake to the most beautiful bird songs. We had breakfast on the balcony every morning, taking in the view of the valley, the mountains, birds, flowers, and waterfalls. The room is cozy and comes furnished with most anything you could need while vacationing at the beach - cooler, beach chairs, tennis rackets, and (some) snorkel gear. Had it not been for the snorkel gear in the condo, I would never had given it a try...snorkeling in Hawaii was a wonderful experience! The resort's staff went above and beyond! Everyone was so friendly and attentive. The only cons I have to list are the fact that the walls are very thin between the units. I felt we needed to keep our voices to just above a whisper to avoid being heard. Second, the condo is in the middle of nature, and spiders and ants cannot always be kept at bay. I am a city girl, and definitely not at ease with bugs and spiders, but they always seemed to keep to one corner of the unit in the foyer. The Bed alone is worth it! I rarely write reviews but since I read over 100 just to rent 1557 for 2 nights I felt that I needed to report back. I will say that the other reviews were helpful especially about the resort itself. There were no surprises other than the amazing king bed the condo had. I chose this condo for 2 main reason's, the price and also the responses I read from the owner himself. He answered everyone's complaints and seemed to take care of any problems immediately I was very impressed with his concern for the comfort of his guests.I will say that the reason I'm giving the 4 stars instead of 5 are for all the same reasons that other's have written about. You can hear your neighbors, especially on the Lanai. We are not quiet people and felt like if our neighbors were on the Lanai, we could not be out there at the same time without them disturbing us or vice versa. And by 'disturb' i just mean the feeling of ease dropping. also, We did have ant's, but I had noticed them on the resort before heading to our room so I was not surprised. We called down to the front desk and someone was there within 5 min. But, then we had to live with the smell of the spray. Since we spent most of our time out doors we really didn't have to deal with it much. Washing dishes in the sink is a bit of a pain I must say. But i was happy with the small kitchenette. it had everything we needed. I would suggest if there is time and money for a small remodel, i would put in a more accommodating sink for washing dishes as well as your face. (i'd also re caulk the tub and freshen up the doors).I'm nit picking because I think this condo is on the verge of a 5 and with small changes it could be.The view is amazing, the decor is warm and inviting...oh and all the gear in the closets is wonderful. Boogie boards, tennis rackets, ice chest etc...I would definitely recommend this condo and would probably stay there myself in the future. Aloha!!! Nice place for a short stay. The limited kitchen facilities would make longer stays challenging. Had to defrost the refer upon arrival as the freezer compartment was completely encased in ice. Hbr is a great resort, well managed with a wonderful pool and beach access. Thank you for the heads up and for your review and stay. The cleaners now have included a check of the freezer compartment in the fridge to make sure that future guests don't have this happen to them. We loved the Luxury, fantastic super great! We loved the beautiful condo, view of mountains,climate, service received, and location to all attractions. Many thanks for a great getaway. Convenient spot to access the North Shore, sweet view, comfy room, beautiful pool and hot tub with waterfalls, complementary ride to the beach for snorkeling. Aloha. We were pleasantly surprised upon entering room 1557. The unit was spacious for a studio and the bathroom space was more than adequate. We stepped onto the balcony and immediately fell in love with the gorgeous views. We sat outside every morning to eat our breakfast. The grounds are nice and 1557 is a short walk to the pool, tennis courts, and the front desk. We were told to request a golf cart ride to the beach but we decided to walk instead. It's a nice walk down but a bit of a steep walk up. The beach is shared with the resort next door and is definitely worth a visit. Be sure to bring the snorkel gear and beach chairs that are in the closet. I do have a few negatives to mention. We noticed ants in the bathroom and in the hallway on the first day that we arrived. I sprayed them with a cleaner that I found in the bathroom. It helped, but they returned each day. Make sure you don't leave any food or trash out. Also, there is absolutely no counter space to prepare your food and all the dishes have to be washed in the bathroom sink. The unit was pretty quiet. However, on the last day I turned the air conditioning off and heard the conversations in the adjoining unit. The service at the resort was helpful and friendly. We absolutely loved that the resort was close to the Napali Coast and Queensbath. I didnt mind that there was no restaurant or store on the premises. There is a Foodland and restaurants to the left of the resort when you exit. I have to mention that making the reservation was easy and the information I received by e mail was very detailed and helpful. Thank you for your review. I agree that my condo is a great place for people looking for serenity and beauty on Kauai. Sorry about your experience with the ants and that does happen if any food is left out. They will be out to let you know that the counters are yet clean! Nevertheless I will stock some ant traps in the condo as well as find out from resort management about treatments happening with the building. * Update November 13 - Resort management says that the ant problem is resort wide issue recently and they are working to solve it. When I did the remodel to put in the small kitchenette there was no easy way to put in a sink, so you do have to do your dishes in the bathroom. I will stop by this month and take a look at some ways to make that easier for guests. Welcome respite after 3 nights of camping. We loved the privacy, the super high ceilings and inspiring view of the Na Pali mountain coast. It had everything we needed. Bed was fabulously comfortable (but creaky!) Like other folks said the walls are thin- if you have the aC on, you may not notice. Also, somewhat lacking in the type of surface you can make a sandwich on- but we managed with the small cutting boards provided. We had a great time- it worked just fine for our needs. We would rent 1557 again. Mahalo! Everything was as expected, but I really enjoyed the nice surprises. The gift basket upon arrival was nice. Also the snorkeling and tennis equipment made it easy to enjoy the beach and the rest of the facilities. Definitely a great stay and the room was beautiful with a great view. This room is a great size for two if you don't want or need a full kitchen for cooking and groceries. The view is spectacular, overlooking the mountains with a waterfall running down the middle one. With the sliding glass doors open you feel like you are in a tree house with the landscape of tropical trees below. The room is comfortable and nicely appointed except for the squeaky bed. If you are a light to medium sleeper beware, the bedframe squeaks with every movement. It kept us up longer as we were trying to fall asleep with the the noises. In addition, the walls are very thin to the unit to the right, next door. We could hear the vaccuum being run as if it were in our room, and hear the neighbors conversations at a normal volume, not speaking loudly. We noticed the volume had lowered as we suspected they could hear us taking as well. We in turn also talked quietly after that. The only thing separating the lanai is a piece of lattice like fencing so you can also hear everything next to you and see through the openings. The big positives were the price, all the beach equipment provided in the closet~two beach chairs, two coolers, a beach bag, 3 snorkel sets with fins, and a boogie board. We appreciated having all of this at our disposal and not having to rent or purchase them. And also, the bathroom was spacious and nicely appointed with all our toiletry needs. The kitchenette has everything you need if you don't have a desire to cook or don't want a large fridge or need a freezer. We like to cook and wanted to store things in a freezer so were disappointed the fridge was a mini one and no more than a microwave and toaster oven. Also, it was inconvenient to have to use the single bathroom sink to also wash dishes. For the price though it was worth it. But considering the drawbacks I wouldn't stay here if the price was higher, or at least much higher. All in all it was a positive experience and would recommend it. This condo had the best lanai overlooking lush tropical landscape with waterfalls in the distance. The beautiful local birds were a bonus. Hanalei Bay Resort has the best hot tub on the north shore. Short drive to Foodland and shops at Princeville. Cant wait to come back. Any thoughts of a great resort quickly slide away as you are delivered to condo 1557. The golf cart takes you by the staff break alcove, the garbage dumpsters, the resort laundry, you name all those beautiful behind the scenes locals. This is the only way to get to Condo 1557 and the nearly 20 condos in this part of the "resort". Each day I would need to walk by all this to get to the parking area. I referred to several guests that I was staying in the "ghetto".On the flip side the condo was beautifully furnished and comfortable, although not very sound proof, I could hear the neighbors next door quite plainly.The whole complex was just that, a condo complex, not what I call a resort at all. You are totally on your own, no activities, no staff(except at the temporary desk as you arrive), no activities, no sundries store, etc etc. UPDATE March 17, 2011: The path to the pool from the condo has been redone and is again open. The maintenance area has been remodeled and the dumpsters are now kept behind gates. The pool and surrounding area have been completely resurfaced and are working great! The restaurant and lounge won't likely be open until 2013 or later. Thank you for your review and I apologize for the current state of Hanalei Bay Resort. Yes, the resort is currently in a transition period following the fire in July 2011 that destroyed the roof of the main building at the resort The roof has been removed and most of the demolition is done and the rebuilding is now beginning. The main pool and hot tub area are being resurfaced and is expected to be functioning again in late December 2011. The front desk, restaurant, lounge and support areas (like the sundry shop) are being redesigned and are expected to open again in 2013. 2012 will be a transitional year at the resort but it is still the best location in Princeville with a beautiful walk to the beach. My hope is that you'll come back after this transition to be pampered with Aloha and to see how wonderful this part of the world truly is. PS: We will continue to update the Aloha Condos website with details on the progress. Our intent is to continue to be forthcoming to our guests as aways. Private Corner of Paradise - just right for us. We stayed in unit 1557 at Hanalei Bay Resort and it was just perfect. The room has a breakfast bar with everything we needed for simple meals or preparing food for the grills down by the pool. The view is fantastic and the privacy is priceless! No other unit faces this lanai - it's just mountains, waterfalls and trees. The bed is comfortable and the unit was very clean. We also appreciated the wifi and the beach gear. The Condo:After much online searching, we booked this condo for our honeymoon. This condo has an amazing view and the privacy on the lanai is second to none. We absolutely loved enjoying our morning coffee and breakfast on the lanai. A major bonus was the boogie boards and snorkel sets in the closet. They also had beach mats, tennis rackets and a few coolers. We really enjoyed our stay. However, it would have been better if the place was cleaner. The floor in the bathroom had hair in the corners and when we looked under the bed there was an empty water bottle and a wrapper of some sort. Also, the faucet in the bathroom was dripping when we arrived and progressively got worse over our stay to the point where it was no longer dripping but lightly running water. We don't like to waste water so we called the front desk and they promptly sent a maintenance crew out to fix it but they couldn't get a part for it so that was that. The Resort:The pool is absolutely beautiful. We didn't spend very much time at the pool because we were always at the beach, but a few times during our stay we lounged by the pool in the evening and then walked down to the beach to watch the sunset. The grounds are so lush and well kept and the walk to the beach isn't bad either. Some people got a ride from a golf cart but we elected to walk-the path is fairly steep in spots. The restaurant had burned down in July so there is no place to eat onsite. Because of the fire, the condo is only accessible through the employee parking lot and you have to walk past dumpsters and a maintenance office/garage. This wasn't ideal but not that big of a deal. Although you have to drive down a street with a bunch of speed bumps, we loved the location of this resort. My sincere apologies for the cleaning issues that you experienced on your honeymoon. Remedies were put in place after receiving your review (I wish that you had contacted us during your stay - I live 15 minutes away) and we will continue to check to ensure that my condo is presented in a clean and well maintained state to all of our guests. Although we appreciate that the front desk can respond to maintenance issues inside of the condo (they are a great group of persons with aloha), we prefer that you contact me or my local staff via the information provided in your check-in materials and posted inside of my condo whenever there are issues that need attention inside of the condo. Unfortunately the fire in July 2011 was still being cleaned up during your honeymoon and it's too bad about the timing. We were very fortunately that nobody was injured. As of March 2012 you can again reach the condo via the path to and from the pool. If guests choose to walk past the dumpsters and maintenance offices, they have been remodeled and hidden along with removal of vegetation that now makes it a much more pleasant stroll.